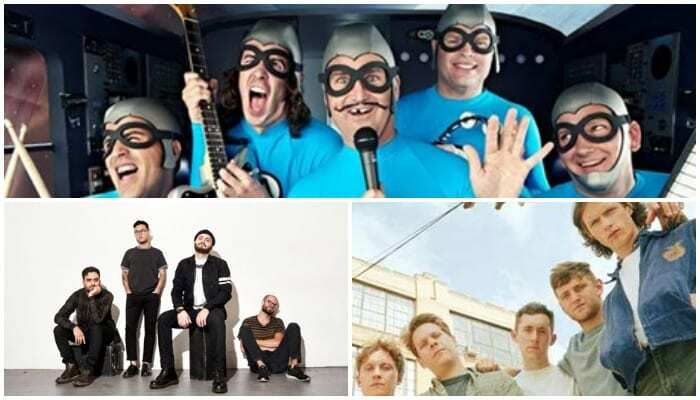 Basement release a new song, and the Aquabats wrap up a Kickstarter campaign. The Aquabats raised nearly $700,000 for their upcoming web series—plus, the Hunna reschedule shows. Check out the news you might have missed today below! Basement shared their new song “Be Here Now” from their highly anticipated upcoming album Beside Myself available Oct. 12 via Fueled By Ramen. Albums may be preordered here. The band will also be headlining U.S. tour dates with Elder Brother and Pllush, and they will be headlining U.K. shows with Joyce Manor. Tickets are available here. Can’t Swim announced the upcoming release of their second album This Too Won’t Pass available Nov. 16. You can preorder the album here. Today, they released a music video for “My Queen,” the album’s leading single. Can’t Swim will be on tour this fall with Trophy Eyes, Seaway, Microwave and Hot Mulligan. Tickets are available here. Musical superheroes the Aquabats created a Kickstarter campaign that raised almost $700,000. Support from their Legion Of Righteous Comrades helped the band become Kickstarter’s top funded web series. You can read more about their campaign here. U.K. rockers the Hunna posted via Instagram that the band would have to reschedule their shows for next year. The decision came after the band sought legal advice about certain decisions that were not specified. The band told fans to hold on to their tickets and wait for rescheduled dates. Post-punk act Strvngers just dropped a cover of Korn’s “ADIDAS.” The track will appear on the band’s Exhumed Vol. 2 EP, which also includes covers of Billy Idol, Nine Inch Nails and more. The band recently released their documentary People Are Strvnge, which follows the act as they play their first U.S. show at SXSW. It also explores the band’s origin as well as their love of horror movies and metal. The doc can be seen here. Exhumed Vol. 2 will be available as a free download Oct. 13 via Negative Gain.